In modern industry, increasing automation in the production facility requires powerful software in background to realize improvements in the efficiency and effectiveness of the manufacturing operation. As a leader in industrial automation, ALLtra Corporation utilizes some of the most advanced nesting software from top developers. When paired with ALLtra's high tech CNC cutting machines, this software helps to provide powerful and user friendly solutions for cutting automation. Two of the primary software systems used by the ALLtra Corporation are Hypertherm CAM and SigmaNest systems. Hypertherm CAM Solutions is a type of software developed specifically for use in automated cutting operations. CAM (Computer Aided Manufacturing) software is written specifically to control the actions of machines in a manufacturing environment. In the case of Hypertherm CAM Solutions, this software is written with the more specific task of controlling the cuts made by cutting machines in an automated manufacturing application. 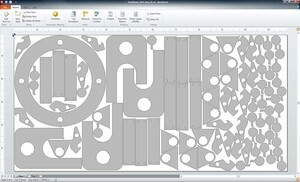 This software can be integrated for a wide range of different cutting machines, including plasma cutting. To provide solutions for different systems and applications, Hypertherm offers a wide range of nesting software, each customized for specific tasks. SigmaNest is a similar nesting software to Hypertherm, but is written for more general applications, which include bending and punching as well as cutting tasks. SigmaNest is a versatile basic software which can be enhanced and customized with a wide range of options to allow for the greatest degree of specialization in specific tasks. Both of these software systems are written to ensure high efficiency production that will save on both time and material costs. Paired with ALLtra Corporation’s customized slutions for industrial applciations and manufacturing, these systems deliver powerfully advanced automation for the manufacturing process. If you are interested in learning more about CAD/CAM and nesting software used with ALLtra Corporation machines, please contact us to set an appointment to discuss your needs with a sales representative or call us at 918-534-5100.